For the record he does have a few pages of similar forecasts up to 2055. I just really don't see the point since there's no clue as to what they are forecasts of or how they can be evaluated, let alone of what value they have to anyone, anywhere. Wet... Dry... Wet twice. WTF? For Tom Curtis (950) The date you seek is 1976. Don Gaddes @952, as there are editorial comments for 1977, and for 1982, the forecast date is almost certainly after those two years. What was the date of publication of the book so that I can know the true date before which all is hindcast? As an aside, I note that your father considers 1813 to be somehow equivalent to 1982. The two years are separated by 13^2 = 169 years. As neither 13 nor 169 figures on your list of significant periods (post 914), either you have misinterpreted your father's theory, or your father indulged in ad hoc modification of this theory to avoid the appearance of being falsified. Tom Curtis (950) The date you seek is 1976. Don Gaddes, the date I am looking for is 1990, the date of first publication of the book (and hence the predictions). It follows that there were only two actual predictions in the section quoted by Sphaerica, one of which was true, and the other false. That means when it comes to predictions (as opposed to retrodictions), your father is as accurate as a coin flip, on the data available to me. I'm done with Mr. Gaddes, but to clarify (since he seems unable to articulate things clearly himself)... Don doesn't seem to understand the difference between a hindcast and a forecast. The book was published in 1990 with "forecasts" from 1976 to 2001. My assumption then is that A. S. Gaddes actually performed hindcasts from 1976 to 1990 (which is cheating, because he also used that same data to develop his model, so no surprise there if he achieves some degree of accuracy) as well as true forecasts from 1990 to 2000. Don Gaddes further extended those forecasts through 2055. You can e-mail Don to get a copy of the book, to see his actual forecasts in the Appendices. For my part, I'm only curious as to what figures (both data source and thresholds) you (and he) are using to determine when a period is "wet" or "dry" in order to evaluate the veracity of a forecast. And, with that said, I still see no point to the entire endeavor. Predicting wet/dry cycles based on climastrology has no influence whatsoever on the temperature of the real world, and A. S. Gaddes' prediction of an imminent ice age is clearly not coming to fruition. Here is a slightly different version of your Figure 3 (in the advanced rebuttal) from a slide talk by Dr. Nathan Schwandron, a professor/researcher in space and plasma physics at the University of New Hampshire. The peak value was in the early 80s. The figure shows a compilation of 45 years of satellite-era total solar magnetic flux (Note: that is not the same usage of flux as in radiative flux (Watts/meter2); it is magnetic field flux, Phi-B = B.A, where B is field strength in Tesla, A is a cross-sectional surface area and . is dot product. Phi-B is thus measured in webers = Tesla meter2). do not show this cooling (on earth) in any way, shape or form. So no, it's not the sun. I'm a bit confused... isn't this, kind of, the whole point of the Foster and Rahmstorf Measure the Global Warming Signal paper? Separation of the GHG .v. other factors? There is a new paper out by Abdussamatov here, he is claims a total decrease in TSI of 6.8 W/m2 due to a decrease in the bicentennial activity of the sun. Of course this big decrease will cause a new little ice age etc. etc. Only problem I have is that I am not able to find anything on the "Bicentennial Decrease of TSI". Link to /pub/data/irradiance/composite/DataPlots/composite_d41_62_1110.dat (PMOD) doesn't work. ShadedX - sorry but it doesnt follow. The path for stellar evolution is that heat from the sun will rise very very slowly (and has been doing so through geological time). As fuel is spent, it will expand and eventually engulf the inner planets, including possibly earth. But not for a few billion years. And as for you scaddnep, I am not talking about a star's lifetime. ShadedX, coronal Mass Ejection (CME) activity varies with the activity of the Sun in it's approximately 11-year cycle, see for example this SEC plot. The ~2000 peak was reasonably large, and followed by the deepest solar minimum in many decades near 2009. The next peak is forecast to be much smaller, peaking in 2013 or 2014. The cyclicity does not explain long-term global warming, and the past decade has been dominated by the progression from the last solar max to the deep solar min. CMEs themselves have little to do with Earth's climate, except that there are more when the Sun is a bit more active. ShadedX - sorry, but it not clear what you do mean then. The statement "Since the sun has loss heated mass, it has less to burn and therefore less heat " does not follow. Since the CME happen all the time, if your statement were true, the sun should be gradually cooling which it is not. 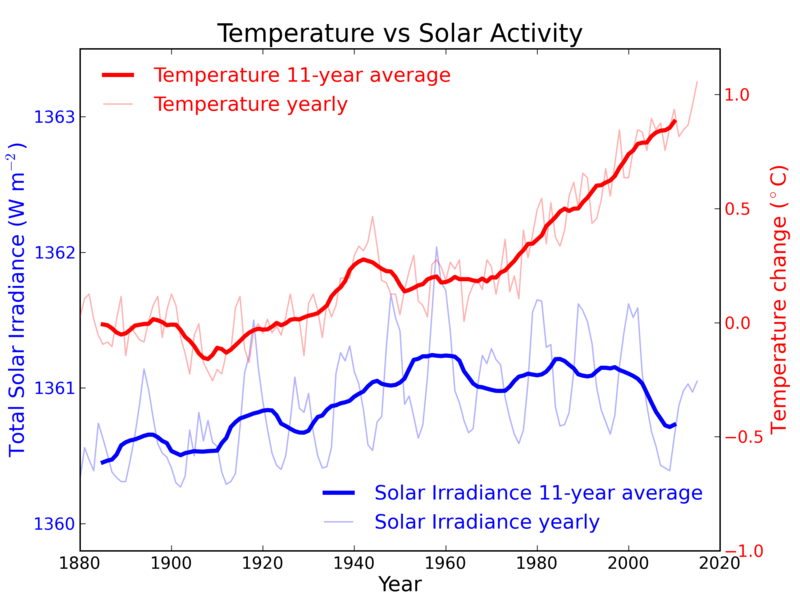 Solar activity does not have to increase to cause warming. It has to be at or above a certain level. Approximately 1365.7 seems to be enough to warm. It pretty much held or exceeded that level from 1918 or so on. Cruzn246 - what is the basis for your statement (ie where is the peer reviewed published research) and how do you explain the cooling since 1918? 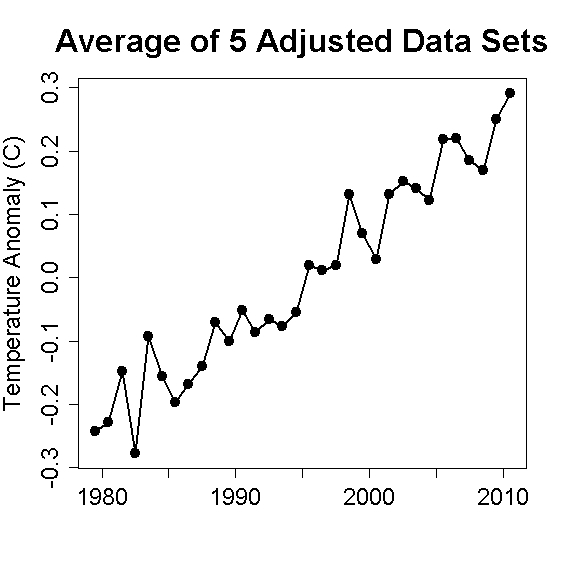 Other theories match the known data better than the statement "1365.7 seems to be enough to warm". One in particular I would draw your attention to is AGW - it not only incorporate the sun (obviously the primary source of heat energy) but it also includes things like water vapor, CO2, soot pollution, ice cover, volcanoes, etc. Check it out -the good news is the heavy lifting has been done - you can read article on this site that address any question you have. [DB] You can peruse Cruzn246's litany of comments here, as he has a long history of posting unsupported assertions at SkS going back about a year and a half. Note the moderator response to this comment over a year ago. Nor is it the first time he has posted such comments on this very long thread. Thanks skywatcher. Though seriouly, I don't believe that the sun effects the climate that much. I just wanted to see what you all had to contradict it. Just wondering: Is it me or are some of the "Response" comments bias? With regards to a comment by one BernhardB here, I am linking to this thread where it is more on topic (at least, I suspect so - if there is a better thread please do point it out). We can, when standing at the Earth surface, empirically measure longwave IR backradiation from the atmosphere, and there are posts on this site and elsewhere documenting this. Just as we can empirically measure from orbiting satellites the effect heat-trapping (aka greenhouse) gases in the atmosphere have on outgoing longwave IR. Then I would like to know why the fins on power transistor heat sinks don`t "back radiate" each other into a China Syndrome melt down. that melt downs are not a common occurence among them. As such, I would suspect the issue is not with either power transistors, their heat sinks, or observed longwave IR backradiation. I would not be surprised if one of the more physics-educated commenters here has more to say. "We can, when standing at the Earth surface, empirically measure longwave IR backradiation from the atmosphere, and there are posts on this site and elsewhere documenting this." Indeed composer. Martha's Vineyard Coastal Observatory, for instance has an hourly (I think) updated graph of downwelling IR. Just click on the link to Infared radiation. Simple as that. Considering there is always some level of IR, even at night, the GH effect deniers have some seriously contorted explaining to do. No doubt that some will try. I'm waiting for Bernhard's words on these observations. Philippe - does this mean that down-welling IR can be measured? But if the GHE doesn't exist, how can that be possible? Interesting that they're seeing >300 W/m^2 with an air temperature of 40F. That's after a couple of days of high humidity and relatively low solar input - it's been cloudy. Could clouds be a positive feedback? Note- the linked figures are for 3/23-3/30. They may change to keep current. "We all know a more active sun means a stronger magnetosphere... up until recently the magnetosphere (a la Sol), was extremely powerful." We all know... not a very scientific argument. Refer to this comment above for some actual data on the sun's mag field. Note the title: Overall Flux Reduction. 45 very flat years. Lockwood et al. [1999a , 1999b] conclude that the total open solar magnetic flux has increased by 41% from 1964 to 1995 and by 130% over all but the last 5 years of the twentieth century. However, solar data for more than two solar cycles ... show no secular trend in overall photospheric flux. More importantly, the magnetic flux open to interplanetary space ... fails to show evidence of a secular increase over the last two solar cycles. It looks like this increase ran during the first half of the 20th century - and then the index went flat. That is entirely consistent with Figure 1 above and the data presented above. This point is very clear: the early 20th century warming was solar in origin. The recent warming is not. Hi all, I'm a biochemistry student at the University of Oxford, and some of the stuff I'm finding here is shocking. There's a complete lack of adherence to the scientific method, very few peer-reviewed studies and logical fallacies everywhere. Don't even get me started on the science, either. Response: [Rob P] Please note the comments policy. If you're here to discuss actual science, then do so. There are plenty of websites on the internet where empty rhetoric is acceptable. SkS is not one of those sites. Please, please, please, TheCriticalThinker: don't be a hit and run. Come back and defend your theses, or, rather, engage in a mutually beneficial dialogue using those theses as starting points. It would be lovely, lovely, but, I strongly suspect, highly unlikely. What is the truth to the assertion/hypothesis that the Earth's orbit is degrading by approximately 1 inch per year. I am at a loss for the location of the publication that provided this information. I do find it curious. Have any of you interested parties read about or researched this hypothesis? Although I find myself wondering about the validity of the assertion/hypothesis, it would seem to be a logical,if not complete cause of warming. What would the effects of increased or decreased solar flare activity have on the Earth with this hypothesis. An interesting point for further investigation. If the Earth's orbit decayed by one inch per annum since 1750, it would be 6.65 meters closer to the Sun, on average than in 1750. Incoming solar radiation varies with the inverse square of distance. So, a decay of 6.65 meters in the approx 150 billion meters radius of the Earth's orbit would result in a 0.00000001 increase incoming solar radiation, or a forcing of 0.000000024 W/m^2. This is compared to the approx 1.8 W/m^2 forcing from increased CO2 over the same period. Therefore such a decay in the Earth's orbit would not have a detectable effect the Earth's climate (and probably would not be detectable to begin with). However, that is beside the point. There is, SFAIK, no evidence that the Earth's orbit is decaying. Indeed, if anything the solar tide on the Earth would cause the Earth's orbital distance to increase, just as the Lunar tide result in the measured increase in distance to the moon. The increase in distance, however, is very small so that there is no reason to think the Earth's orbit will increase or decay significantly at any time in the past or future several million years. Icyhot - in addition to Tom's comments, the beauty of the mainstream climate science view of atmospheric CO2 as Earth's thermostat - is that it has explanatory power. Turn up the CO2 and the Earth gets warmer, turn it down and the Earth cools. Aside from maybe one outstanding complication, the Miocene, this relationship holds true for hundreds of millions of years back in time. There are, of course, other control knobs on Earth's climate - such as the Milankovitch Cycles, but CO2 is very clearly the Big Kahuna. If, as you suggest, the Earth is moving closer to the sun, why then was it much warmer on Earth further back in time? And as a final point - if we were getting warmer because we were getting closer to the sun, then we should see that in the TSI measurements. As shown in the main article, this is not the case. My main issue with it is the term: "Total irradience" from which the conclusions are based. It might supprise people to know that the term only includes visible light and does not even include the ultraviolet spectrum. If conclusions are based on less than 10% of the measured EMR emitted from the Sun how realistic are the results ? Response: [DB] A prudent person would ensure that they had read both the Intermediate and Advanced versions of this post before making such a strong demurral. It might surprise people to know the term only includes visible light and does not even include the ultraviolet spectrum. Similarly, other discussions of TSI do not discriminate between spectra of radiation emitted by the Sun (e.g. visible light, UV, shortwave IR, &c), such as the IPCC AR4 WG1 Glossary or this University of Colorado solar radiation project site. Do you have sources for your claim about the spectra covered under TSI? Response: [DB] Fixed html tag. Where did maximo get that information from? Thanks Riccardo, the information of what actual radiation wavelengths and the definition of "total irradiance" being measured by those satelites can seen on those links you gave. They are measuring in the nano meter range, which is within the visible spectrum though includes some of the Ultraviolet and Infrared wavelengths that are not visible. My issue still stands, 'total irradiance' is not all wavelengths that the Sun radiates. The Sun has microwave emissions and xray emissions and other high energy particles. Clearly not all wavelengths are being measured..
Also note these satelites have only been in orbit for a short period of time and the Temperature versus Solar Activity chart at the beginning of this blog dates back well before 2004 and I wonder how accurate modelling was done before these satelites existed? I'm glad you admitted you were wrong claiming that TSI only include visible light but still you're missing something. The ERBE mission started somewhere in the late '70s, I'm sure you can easily find the exact date. Apparently you missed that the range 1-2000 nm of the SORCE instruments covers 95% of the total irradiance. I can't quantify how much energy is emitted in the 1-200 nm range and I'm to lazy to check, but I'd expect it's going to be a small part. The same applies to the far infrared and microwave range. There's really no issue with TSI apart from tiny discrepancies between different instruments. maximo @983, radiation from the Sun follows a black body curve. As such, observations of emissions within a fairly small range of frequencies are enough to quantify its total radiation with a high degree of accuracy. Sufficiently high so that correlating emissions between different instruments is a much larger source of error. Admitting Ultraviolet and Infrared as being just outside the visible range isn't an incorrect statement. coverage is still not measuring the larger proportaion of the non visible Solar emissions. the earth with 26 million kilowatt hours of thermal energy, enough to power New York for 2 years. NASA have a specially designed satelite to measure those activities, but it is only very recently. maximo @986, do you mean to say that the Earth has been hit with solar storms having an power equivalent of 1.2*10^-8 W/m^2 over the year, and you think that that will massively distort the energy balance equations. Even if we where hit by one of those storms every hour, on the hour, it would only add 0.000005 W/m^2 to the average (after albedo) 240 W/m^2 incoming solar radiation. I am really struggling to see your point here. [DB] Please refer more closely to the comments policy (linky adjacent to the comments input box) when constructing comments. All-caps contravenes said policy and subjects comments to moderation. Furthermore, please note that repetitive posting constitutes sloganeering, also a CP violation. FYI. Okay. Big difference. That means one of those storms every hour, on the hour would add 0.0005 W/m^2 to the 240W/m^2 of incoming solar radiation. I think that is considerably less than the error in the observing system. A simple equation would be 8,244,910 million New York residents x 1000 days = 8 billion persons power usage. Although not everyone on the globe has electricity or uses electrical heating. maximo @988, you are claiming that satellite sampling of solar radiation is insufficient to constrain TSI. Your evidence is the power of some solar storms which are not sampled by the instruments used to sample solar irradiance. However, even as corrected, one of those storms an hour every hour over the year would only increase solar irradiance by 0.005 W/m^2, well less than the error margin of the 240 W/m^2 we receive from the Sun. During the course of the storm, the power recieved amounted to less than, 0.000002 W/m^2 or less than one ten millionth of a percent of the 240 W/m^2 irradiance from the Sun. What is more, according to the video on which you rely, 95% of that energy was immediately reradiated to space from the thermosphere, with only 5% entering the lower atmosphere and hence effecting the Eearth's energy balance. I have to thank you for this. I did not previously know the relative power received by the Earth from solar storms. Now I do, and it is inconsequential relative to any other source of energy contributing to warming the Earth's surface. As it turns out, it is less than any other source I had previously considered, and on a par with the 0.000003 W/m^2 the Earth receives from the Cosmic Background Radiation. Response: [DB] The thermosphere is not the primary location of most of the greenhouse gases. The tropopause is considered the location of the optical depth emission layer. Solar radiation is not limited to the thermosphere, about half the solar radiation is absorbed by the Earths surface and warms it. maximo @993, are you still trying to beat your confusion up into an argument against global warming? The thermosphere is not "where the greenhouse gases are located". With some exceptions (Ozone, water vapour), greenhouse gases are distributed approximately equally throughout the atmosphere. That happens to mean there are some greenhouse gases (CO2 and NO2) in the thermosphere where they are too thin to have any appreciable effect on the greenhouse effect. However, because the can radiate in the InfraRed spectrum, they are the primary means of radiating away the heat absorbed in the thermosphere by collisions with solar particles. Actually about 70% of solar radiation is absorbed by the Earth, lower atmosphere (troposphere) and stratosphere. Virtually none is absorbed by the thermosphere. However, the energy from the solar storms is largely absorbed by the thermosphere, from which 95% is radiated to space, and only 5% radiated towards the surface according to the NASA video you linked to. Those observed facts from NASA show the atmosphere cools in a short period of time. What exactly is confusing or goes against what you believe?. Atmospheric gases are found high up into the atmosphere 600km and the greatest concentration of them is at 25km. The average density of gases in the atmosphere is log 10 cm -3.
maximo, rather than continuing to be cryptic, please concisely make whatever-it-is point you are trying (and failing) to make. Unless your goal is to waste the time of others. First, the NASA video indicated that the extra energy in the thermosphere accumulated because of the solar storm dissipated in a few days. To dissipate that energy, the thermosphere had to radiate around 0.000002 W/m^2 (or less) over those few days. This has absolutely no bearing on how long it would take to dissipate the approximately 900 thousand times larger energy imbalance in the lower atmosphere due to anthropogenic effects, particularly as that energy imbalance is not a temporary (three day) storm, but an ongoing flux. Second, the graph you show only shows the density of three atmospheric gases, Molecular Oxygen (O2), Nitrogen (N2) and atomic Oxygen (O), along with the density of electrons. The atomic oxygen and electrons are formed by molecular oxygen being split by UV radiation, thereby absorbing the UV radiation. As can be seen, the relative densities of O2 and N2,ie, d(O2)/d(O2+N2) and likewise for N2, where d(x) is the density of x, are near constant in the mesosphere and below. Above the mesophere, the relative density of O2 + O, ie, d(O2 + 0)/d(O2 + O + N2), is also near constant and approximately equal to d(O2)/d(O2 + N2) in the mesosphere and below. In other words, what the graph shows is only that the relative density of O2 is reduced by the splitting of O2 into two oxygen ions by UV radiation. That has no bearing on the densities of CO2 and NO2 which are typically not split by UV radiation. Finally, I grow tired of having a discussion where I have to deduce your implied point, made with irrelevant data, and largely irrelevant to the topic of discussion. There is a name for posting claims containing no clear argument and serving only to identify that you disagree (or agree) with the OP, or subsequent discussion. It is called sloganeering, and is contrary to forum rules. Unless you begin to clearly state not only what evidence you think you are bringing, but how it relates to the thread topic and ongoing discussion, I suggest your posts simply be deleted as being in violation of the comments policy. [DB] Please note that posting comments here at SkS is a privilege, not a right. This privilege can be rescinded if the posting individual treats adherence to the Comments Policy as optional, rather than the mandatory condition of participating in this online forum.